It looks like Dropbox has made another acquisition today in the photo space: it has acquired Bubbli, a startup that has built some innovative ways of incorporating 3D technology into 2D views, and packaging it in a mobile app for ordinary consumers to use. We’re reaching out to get more details from both companies. For now, Bubbli has been sending out a notice to its users today announcing the deal. The note points out that Bubbli is not popping, so to speak. The tech is getting integrated into Dropbox, and in the meantime the existing Bubbli app will stay alive. 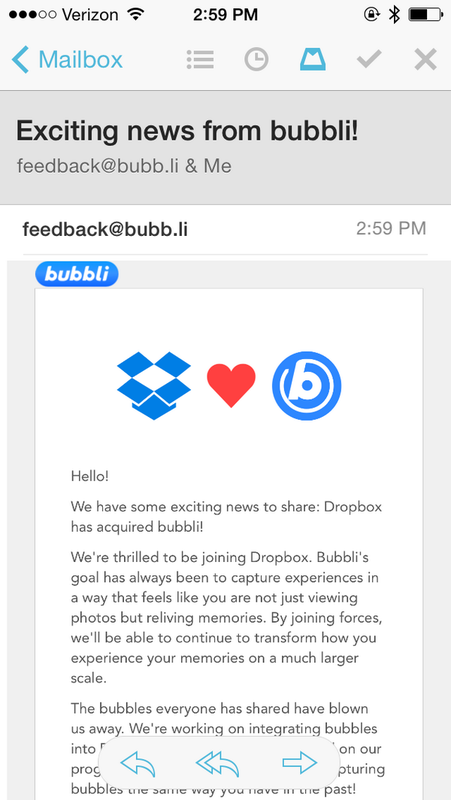 We have some exciting news to share: Dropbox has acquired bubbli! We’re thrilled to be joining Dropbox. Bubbli’s goal has always been to capture experiences in a way that feels like you are not just viewing photos but reliving memories. By joining forces, we’ll be able to continue to transform how you experience your memories on a much larger scale. The bubbles everyone has shared have blown us away. We’re working on integrating bubbles into Dropbox and we’ll keep you posted on our progress. Until then, you can continue capturing bubbles the same way you have in the past! Thank you for all your support thus far and here’s to the future! Bubbli was founded by two Stanford alums, Ben Newhouse and Terrence McArdle, who have respectively broken ground in imaging technology. The two met at Stanford and started to work together combining their expertise, resulting in Bubb.li — which gives users the ability to take panoramic-style pictures with a sweep of their phones, and then use those to create spherical-like, moving pictures, complete with sound. The acquisition builds on Dropbox’s existing assets in the photo space — specifically acquisitions like Snapjoy (which was eventually shut down) and Loom — as well as the launch of its photo storage app Carousel earlier this year. But what’s interesting about Bubb.li is that it marks a new chapter for Dropbox on the photo front. Snapjoy and Loom were startups that focused on smarter ways of organising your photos — Snapjoy helped unify disparate photo albums on different platforms and organise them chronologically and with some serendipitous resurfacing of pictures you may have forgotten existed; Loom had a clever way of letting your store large files but use faster and smaller ones on your mobile device. Bubb.li, however, is more about the art of creating pictures, and doing more innovative things with the basic images you are recording and storing. In my opinion, this points to how Dropbox is looking to add more value to its services, beyond that of a basic and efficient storage provider. As the company grows, it’s only natural that it will look to attract a wider range of consumers, beyond power-users who need tons of storage space and early adopters. With something like Bubb.li, you can imagine that some users may come for the pretty pictures, and then stay for the premium storage, or the other services Dropbox has today, or may have in the future — or so the hope may be, at least.